Mycofend is a comprehensive blend of specific mushroom compounds and specialized beta glucans designed to prime the immune cells and boost immune function. A strong immune system is integral to overall health and well-being. Maintaining a strong immune system can often be a challenge in today’s world: High stress levels, poor diet, lack of sleep and environmental pollutants can slow down immune response. Mycofend is a blend of Wellmune® WGP (whole beta glucan particle) and selected medicinal mushrooms which work together to prime immune cells and protect against immune challenges. Its main ingredient, Wellmune WGP® is the most well-researched, single beta glucan, proven in clinical trials to prepare and protect the immune system from repeated and ongoing stressors. 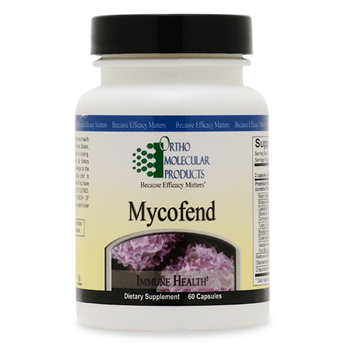 Mycofend also provides a blend of mushroom extracts including Maitake Gold 404 (MTG), and mycelial biomasses of shiitake, reishi, turkey tail, oyster, caterpillar, and Brazilian mushroom for a complete, synergistic approach to immune modulation.